Bishop Robert P. Deeley was joined by priests, deacons, and parishioners from throughout Aroostook County for the celebration of the Mass of the Holy Oils on Wednesday, March 28, at St. Mary of the Visitation Church in Houlton. HOULTON, Maine — Bishop Robert P. Deeley was joined by priests, deacons, and parishioners from throughout Aroostook County for the celebration of the Mass of the Holy Oils on Wednesday, March 28, at St. Mary of the Visitation Church in Houlton. During the Mass, the oils that will be used in the sacraments during the upcoming year were ceremonially presented to the bishop and distributed to the priests serving in northern Maine. 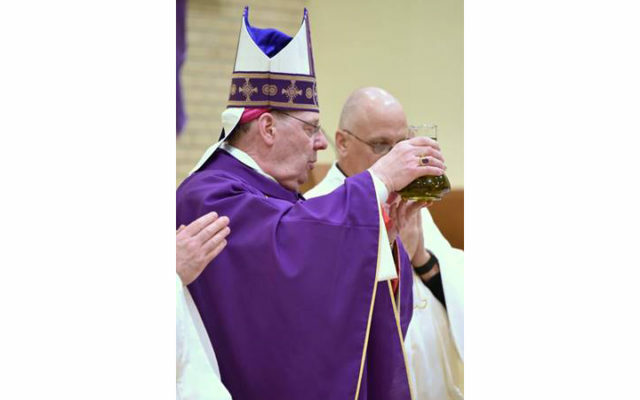 “Those oils will be used for anointing, particularly in those sacramental signs that mark us as a people who have received the gift of God’s Spirit in our lives: baptism, confirmation, holy orders, and anointing of the sick,” said Bishop Deeley. The oils include the oil of the sick, the oil of the catechumens and the sacred chrism. The bishop consecrated the sacred chrism and blessed all the oils the night before during the Chrism Mass, held at the Cathedral of the Immaculate Conception in Portland. While most parishes receive the oils at that Mass, due to the size of the diocese, it is customary for the bishop to carry the oils north the next day to celebrate with the faithful there. The bishop stressed that it is a mission the world needs. The bishop said the message of Jesus is one the faithful are called to bring to others. As was the case at the Chrism Mass, the Mass of the Holy Oils is also an opportunity to celebrate and thank the priests of the diocese and for them to renew their commitment to priestly service. Priests concelebrating the Mass and receiving oils serve at Notre Dame du Mont Carmel Parish in Madawaska, Our Lady of the Valley Parish in Saint Agatha, Parish of the Precious Blood in Caribou, St. Agnes Parish in Island Falls, St. John Vianney Parish in Fort Kent, St. Mary of the Visitation Parish in Houlton, and St. Peter Chanel Parish in Van Buren. The Mass of the Holy Oils is celebrated on the Wednesday of Holy Week, as the Church prepares to celebrate the Easter Triduum, when Christians celebrate Christ’s passion, death and resurrection, which are at the heart of the faith. For links to Mass and service times around Maine, visit the Diocese of Portland’s special Holy Week section at www.portlanddiocese.org/content/holy-week-2018.